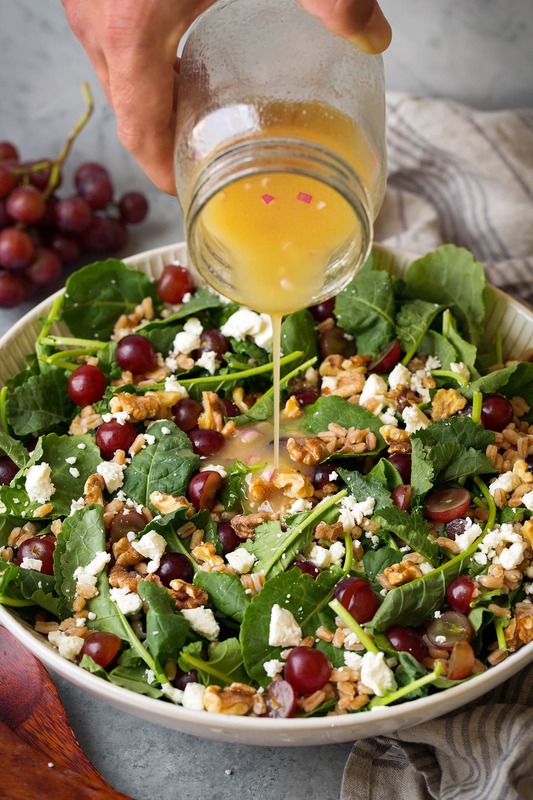 This salad includes tender baby kale, nutritious farro, sweet grapes, salty feta and a tangy white wine vinaigrette. It’s a unique salad that’s adds something new and exciting to the menu! 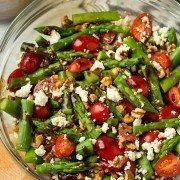 I’m loving all the summer salads lately! This Kale Grape and Farro Salad is so refreshing and it’s packed with healthy ingredients. I love that it uses tender baby kale leaves rather than the tougher, heavier curly kale which has a rougher, stronger flavor. 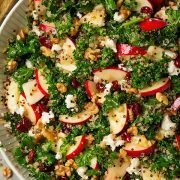 Pair the kale with fresh crisp grapes, salty feta, crunchy walnuts, a zesty dressing, and hearty farro and you’ve got a salad worth remembering! What Do You Cook with Farro? 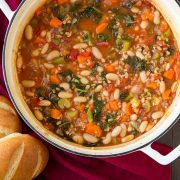 I like to eat farro in soups and salads and it’s even good enough to eat plain, in place of things like brown rice. You can also make a risotto type dish with it. Many grocery stores are starting to carry it now, you can usually find it by the rice and quinoa. How do You Cook Farro? You’ll need 1 part farro to about 3 parts water, and a bit of salt. Rinse and drain the farro in a fine mesh sieve. Place in a saucepan or pot. Add salt and enough water or stock to cover. In a jar combine olive oil, white wine vinegar, honey, mustard, shallot and season with salt. Cover with lid and shake to blend. Chill until ready to serve. 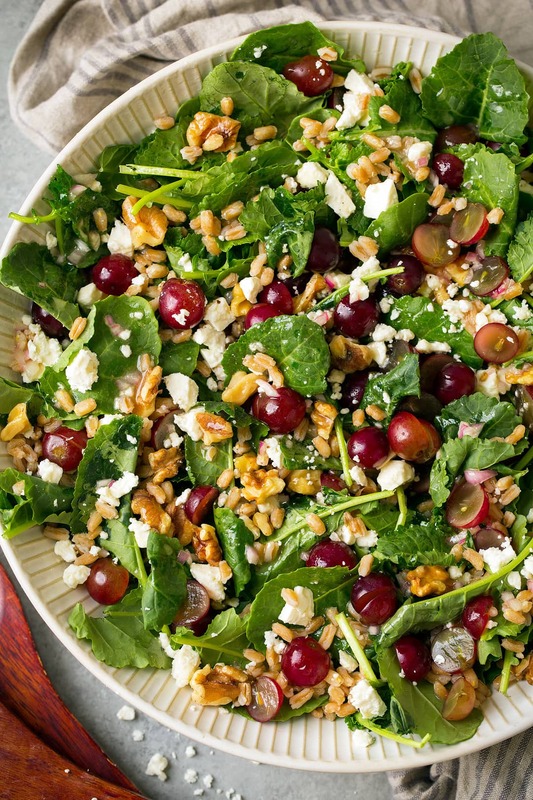 Add kale, cooked farro, grapes, feta and walnuts to a salad bowl. Pour over dressing and toss to evenly coat. A healthy farro recipe! 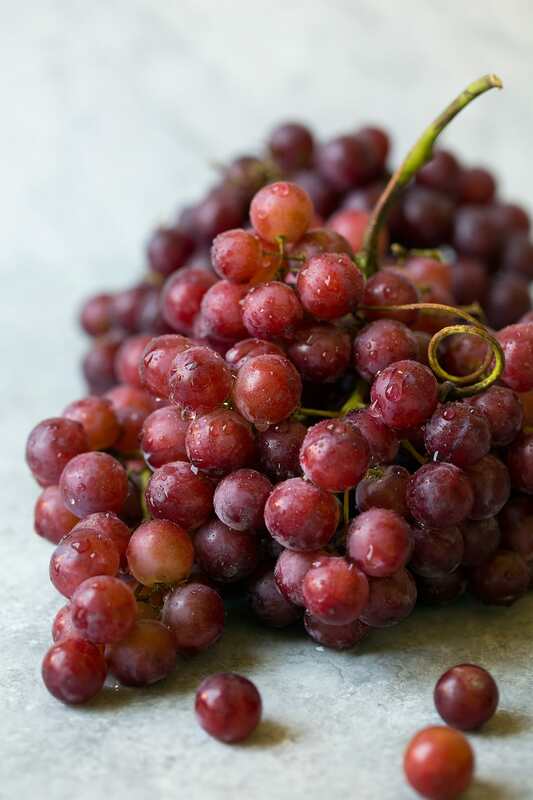 This salad includes tender baby kale, nutritious farro, sweet grapes, salty feta and a tangy white wine vinaigrette. It's a unique salad that's adds something new and exciting to the menu! For the dressing - In a jar combine olive oil, white wine vinegar, honey, mustard, shallot and season with salt to taste (about a heaping 1/4 tsp). 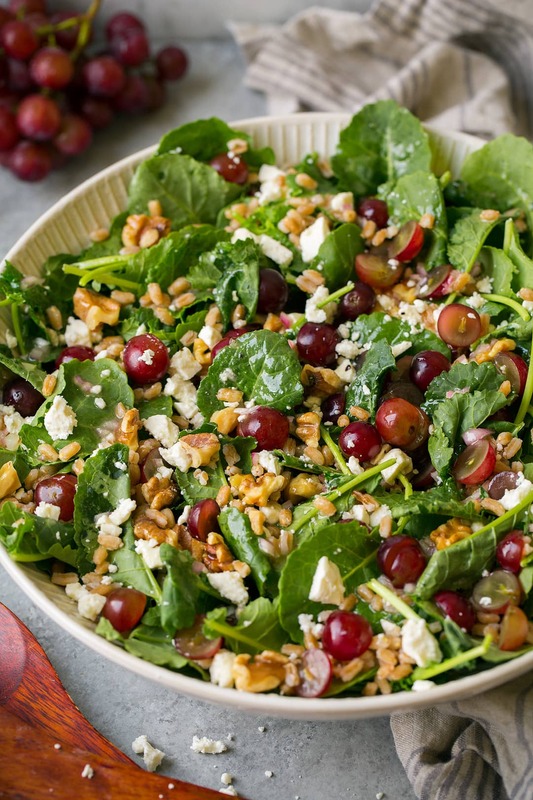 For the salad - Add kale, cooked farro, grapes, feta and walnuts to a salad bowl. Pour over dressing and toss to evenly coat. Serve immediately.